"Was surprised how good and fast this whole process was, from C/S communication to ease of the transaction, I will be recommending this site to everyone. Thanks again." "I just love the service and the speed and the saving of course :)"
"Awesome service! Great savings! Very recommend!" "Savings even on boxing day! Awesome!" "Rate is really compare with the others,saving is main purpose for everyone.shipping takes a little bit longer,usually about 7-10 days to receive the card in mail." "The card came very quickly. The price was awesome, and the $5 off was definitley was good incentive. It has Winners/Homesense cards (yeah my favourite stores)"
"I love this site. Order a card and go to the store and save money on top of the sales that are already going on." "A lot of gift cards to choose from"
"I find the buying process quite simple and hassle free as all the gift cards are already verified and they can be sent to your home without extra charge." "good sale and save money." 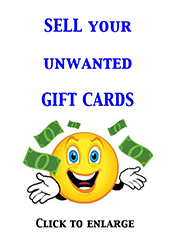 "I started buying gift cards from a rival website and things were all good, they then got more greedy and savings were reduced to about 3 percent yet they were only paying about 60 percent and pocketing the rest! I do realize that companies are in business to make money, but they started to gouge and that is when I started looking elsewhere and found Gifcardswild.ca and since then have been saving on average 10-20 percent!" "excellent and felt safe to order with gift cards wild. I found your shipping also very prompt and quick. 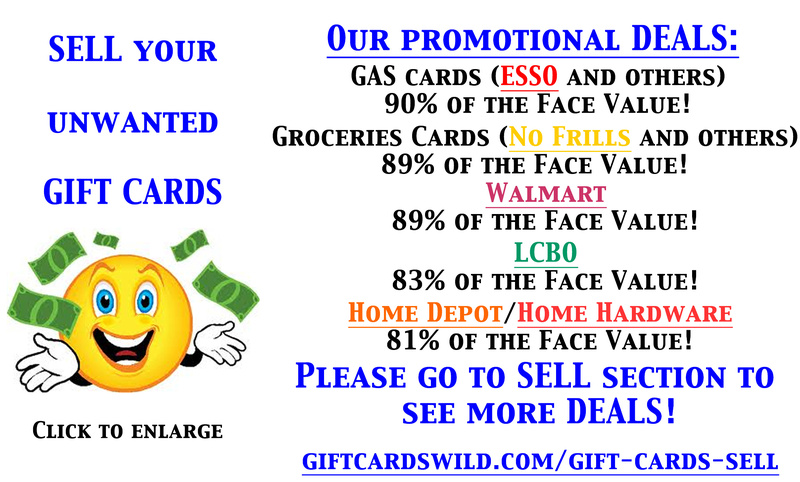 I now do not look any were else then GCW for gift cards"
"purchase and sold gift card with GiftCardsWild. Both quick and easy. Will do business again for sure." "Service was fast but the process was confusing - my order was never confirmed and I had to send an email to inquire. I received a reply very quickly though. My cheque was mailed very quickly also." "I enjoy the fact that this web site is well designed, and user friendly." "An easy step to selling my gift cards, they pay better than other sites as well." Welcome to Gift Cards Wild Wishlist. Please add the Merchant name and value to your Wish List. You will receive an email, once we have your card(s) available.